I'm home from school today as we wait to see what Sandy will bring. The forecast is calling for rain, wind, and even snow. Folks around here have doing quite a bit of storm tracking. We're as ready as we can be. So, today I'm thinking about weather. Will you write a weather poem with me this week? Leave me a note about your poem and I'll share the results in time for Poetry Friday. Before you go, check out the fabulous collection of fairy tale poems written for last week's stretch. Friday I shared this poem in honor of the upcoming holiday. I've always liked this poem, in part because I love fairy tale poetry. Here's another poem I love. You can read more poems like this at The Journal of Mythic Arts: Fairy Tale Poems. This week I'm heading down the fairy tale path. Right now I'm writing poems about magical objects, having been inspired by the apple poem. Perhaps I'll write about a pumpkin coach. Who knows?! I hope you'll join me in writing some fairy tale poetry this week. Leave me a note about your poem and I'll share the results in time for Poetry Friday. My son asked me last night if he was too old to dress up for Halloween. I've never liked the holiday so I should have said yes, but it seems we'll be making a costume in the coming week. Hoping for a little inspiration today, I pulled a few beloved Halloween poetry books off the shelf. I actually have two Halloween books by Eve Merriam. One is Halloween ABC, published in 1987 and illustrated by Lane Smith. 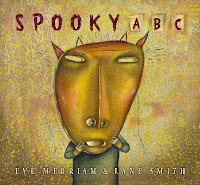 However, I must say that I am even fonder of the 2002 revised edition retitled Spooky ABC. Besides the absolutely pitch-perfect poems and illustrations, one of the most interesting things about the book is the section at the end entitled "The Awful Truth Behind The Making Of Spooky ABC." In it, Lane Smith describes how the first book and revised edition came about. This section also includes images that were created for the first book, but ultimately dropped because Merriam's poems suggested other illustrations. For example, vampire was lost to viper, tree to trap, and cat to crawler. (I do LOVE the cat illustration, as well as the one for invisible. I wish you could see them!) There is just so much to love in these words and illustrations. Today I'm sharing the poem for the letter A. In the book it is accompanied by an image of a red apple held in a hand with long, slim fingers tipped with long fingernails. The round up this week is being hosted by Irene Latham at Live Your Poem. Do stop by and take in all the great poetry being shared. Before you go, be sure to check out this week's poetry stretch results on the topic of home. Happy poetry Friday, all! First, I want to thank everyone who wrote for last week's challenge. While I did not have access the internet while I was away, my smartphone and your poems kept me going. A few of these poems even had me laughing in the face of airline delays and bumpy plane rides. So again, I thank you! Please check out the poems written for the topic On the Road. I went home last week, but it really isn't home anymore. It happens to be where I grew up. It's where my mother still lives. On the flight back to Richmond I realized that more than half my life now has been spent somewhere outside of the place I still call home. When people ask where I'm from, I still think New York, not Virginia. That response always makes me wonder how people define home. Can you have two homes, not the brick and mortar type, but homes of the heart? Maybe our poems this week can answer that question. Let's write about home. Leave me a note about your poem and I'll share the results in time for Poetry Friday. Do you like to travel? I've been doing a lot of obligatory travel lately and it's not nearly as much fun as long-planned and awaited trip. It's also not as much fun as an impromptu day trip. I was at a conference last week and I'm leaving again this week to visit my Mom. The former will be much more enjoyable than the later. In any case, travel is on my mind. Whether by car, train, plane, boat, or any other form, hitting the road can be exciting. No matter what happens, travel is always bound to be interesting. So while this is on my mind, let's write about hitting the road this week. I may even write my own poem while making my way home. Leave me a note about your poem and I'll share the results in time for Poetry Friday. By the way, last week the challenge was to write personal ad poetry. The results were a lot of fun, so do stop by and check them out. Nominations have opened for the 7th annual Cybils award! Anyone may nominate one book per genre during the public nomination period. If you try to nominate more than one book per genre, or if the book's already been nominated by someone else, you'll get kicked back to the main page. That's okay though, just go with your second or third choice! Here's the nomination form. I'm off myself to nominate a few favorites. When my issue of The Horn Book arrives in the mail I first turn to the last page. I know I should save it for last, but it's one of my favorite things about the magazine. In the January/February 2008 issue is an Ad Hoc page by Alicia Potter that reads like the want ads. There are sections on Services Rendered, For Sale, Real Estate, and Personals. These are all perfect little puzzles that beg the reader to determine the books and characters alluded to by the writer. Here's an example. FRENCH TWIST. Me, you, Paris? Contact Madeline at (011) 33-494-55-87-24. Now just imagine how much fun this would be if it were written as poetry. I gave it a try and here's what I came up with. It needs work, but you get the picture. I tried to write it like the example above, but the lack of line breaks bothered me. So, there's your challenge, to write a little personal ad poetry. Extra points to you if you can write about a character from children's literature. Leave me a note about your poem and I'll share the results in time for Poetry Friday. Have fun!